As we approach the most blessed nights of the holy month of Ramadhan, we are preparing ourselves to spend these nights in prayer and supplication. We want to maximize the blessings we receive during these nights, inshaAllah! 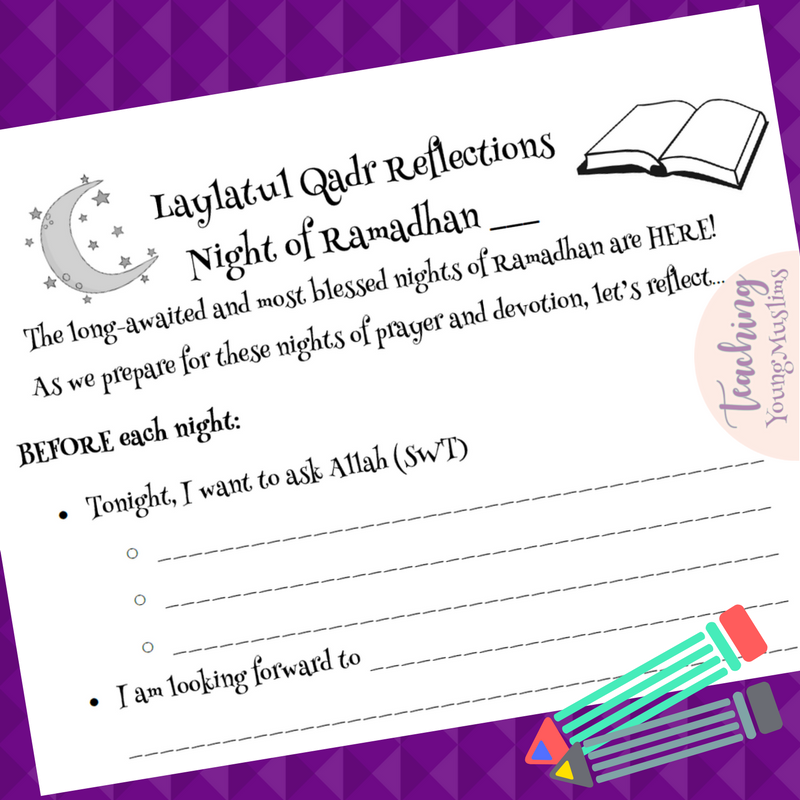 For these nights, you can download a worksheet that will help our kids reflect on Laylatul Qadr. You can print out a separate worksheet for each night. Each worksheet has a couple of prompts to reflect on BEFORE each blessed night, and a couple of prompts to reflect on AFTER each blessed night. To download these Reflection Worksheets, go to the Teaching Young Muslims Resource Library! Enter your name and email address here to receive the password to access these downloads. Already signed up? Enter the library HERE. Once you enter the library, click on “Ramadhan and Eid” and scroll down to “Reflections on Laylatul Qadr” and choose which size paper you want. InshaAllah these worksheets will help guide our preparations for Laylatul Qadr and will allow us and our kids to reap the benefits of this night.